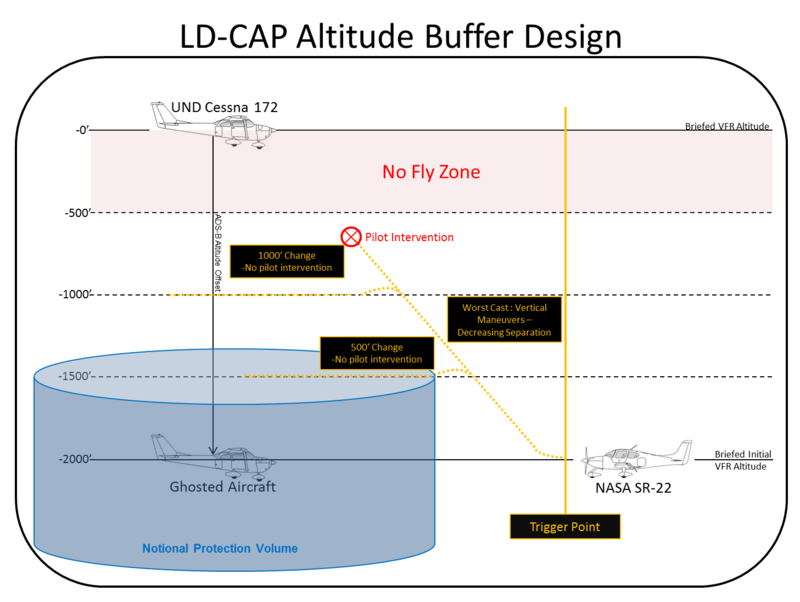 An extensive set of LD-CAP test flights was conducted from 10-22 September 2012. 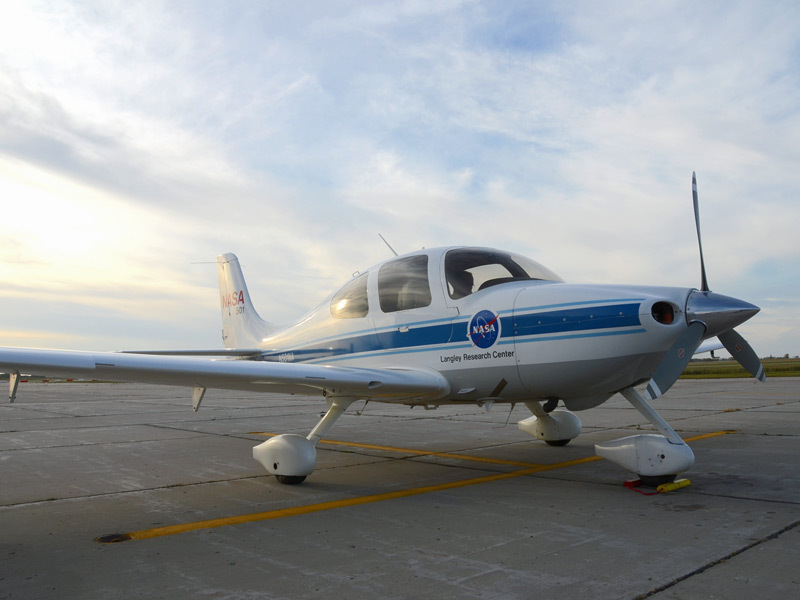 These tests utilized the NASA-Langley SR-22 surrogate UAS and UND’s Cessna 172 aircraft. During this time, the SR-22 logged 39 hours, with 147 different encounters/tests of cooperative automatic sense and avoid (CASA) algorithms. The NASA-Langley SR-22 was modified to offer a unique solution to testing UAS concepts, hardware, and software. This aircraft is a manned aircraft that is outfitted with hardware and software such that it can act as an unmanned aircraft with the flip of a switch. The pilot-in-command and research systems operator both have the ability to disengage the unmanned aircraft mode through multiple hardware disconnects. The ability to switch between manned and unmanned mode enables testing of key algorithms. The presence of a pilot on board the aircraft allowed the September 2012 tests to be performed in the NAS and outside of restricted and/or specially designated airspace, such as that obtained through the Certificate of Authorization (COA) process. The NASA-Langley SR-22 was designed to be a surrogate UAS in that it can be controlled, in UAS mode, from either the back seat of the plane or from a ground control station. During the 2012 LD-CAP flight tests, the UAS control came from on board the aircraft through separate computers running the test algorithms. These algorithms were created through previous sense and avoid work done by UND and MITRE and went through a rigorous simulation to flight process developed by MITRE and NASA-Langley before being used in flight tests. This process enables the flight tests to not only provide validation data for the algorithms, but for the simulation-to-flight process as well. The map below shows the approximate location of the 2012 test flights (orange circle). 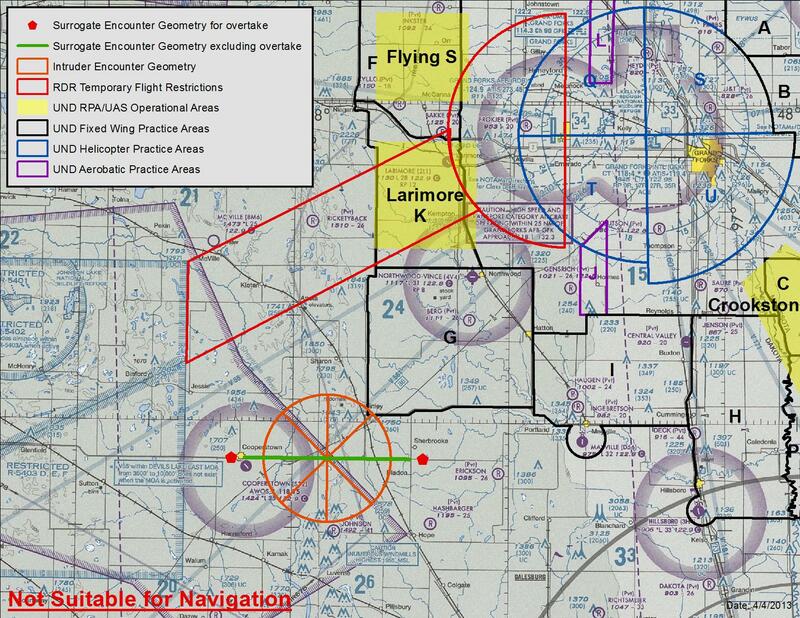 They were located just southwest of UND’s fixed wing practice area G and just east of restricted airspace (RA) R- 5403 D/E/F (light blue polygons on the sectional map). 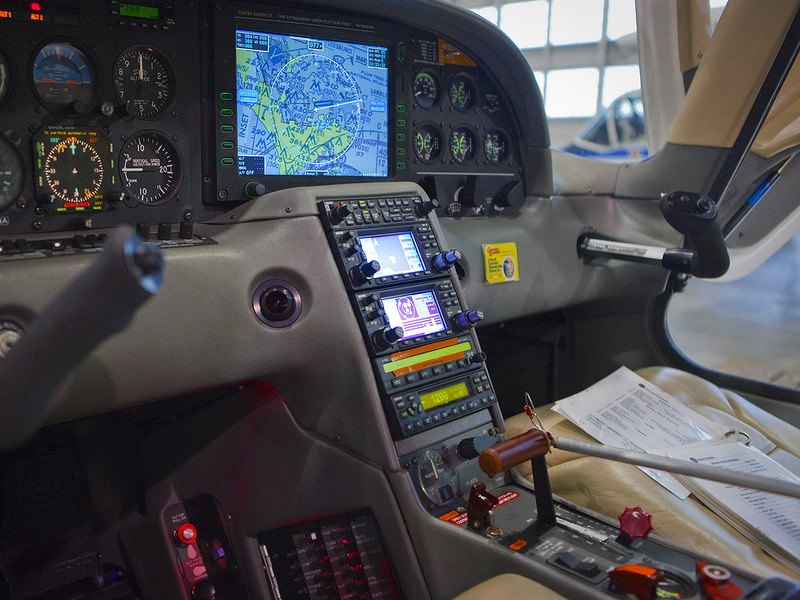 Other airspace identifiers include TFRs, UND’s UAS COAs, UND’s fixed wing, acrobatic, and helicopter practice areas, as well as the basic sectional map indicators. The 2012 flight tests involved 1 v 1 orchestrated encounters between the NASA-Langley SR-22 and the UND Cessna 172 separated by 1000+ feet to ensure safety. The algorithms were ‘tricked’ into thinking that both aircraft were at the same altitude. Several basic scenarios were tested including, but not limited too, over taking, head on, and crossing at different angles. The 2013 tests will utilize a similar layout, but will include more dynamic encounters (e.g., turning into conflict). Finally, refined versions of previous algorithms will be tested along with other algorithms including those from Draper Laboratories and others. Last Update: 10/21/2015 Comment on this page.